Andrew Reynolds became a self-made Millionaire at the age of 45 after starting a small business in his spare room at home – and became a Multi-Millionaire by the time he was 50. He went on to win the coveted Surrey Business Person of the Year Award together with theSmall Business of the Year Award. Further awards have followed including Business Event of the Year and Best UK and International Conference for his sold out Entrepreneurs Bootcamp – a charity event which he held at the O2 Arena in London. Attended by 8,000 aspiring home based entrepreneurs from all over the world, this event raised over £700,000 for the Make-A-Wish Foundation children’s charity. He has since appeared on television a number of times, on Sky, BBC1 and BBC2. He became a Patron of the Prince’s Trust and has been commended for his business initiatives for young people such as Make Your Mark with a Tenner. An initiative he funded to teach young people about making money on a limited budget and about the importance of social responsibility. Social responsibility is a subject Andrew is passionate about which is why, more than just creating his own personal financial success, he has also used the ideas he shares in his latest book – COPY THIS IDEA published by Wiley – to raise millions of pounds for national children’s charities such as Great Ormond Street and the Make-A-Wish Foundation along with other local charities including Disability Initiative and the Phyllis Tucker Hospice. Andrew Reynolds award winning event at the O2 Arena in London attended by over 8,000 aspiring entrepreneurs. 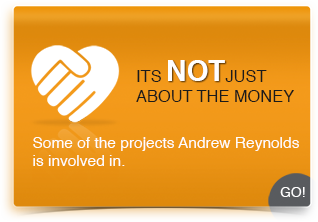 Over £1million has been raised at Andrew Reynolds events for the Make A Wish Children’s Charity. Andrew Reynolds was awarded the Surrey Business person of the Year award together with the Best Small Business Award. Copy This Idea went straight to number one in the book charts. And she was right. I’m nothing special. I’m not some glitzy TV Business Guru or someone whose face you see every other day in the papers. I’m nothing special – I’m just an ordinary bloke who keeps himself to himself… who left school with 4 GCE’s – including woodwork and drawing. I’m not an expert on ‘the world of business’ and you certainly won’t find me at one of those awful ‘business networking events’. No – I’m just an ordinary bloke who, bored with his full time job, the commuting in traffic, the bosses I hated and the ‘just getting by each month’… stumbled upon a great way for someone with no business qualifications and no experience, to start and run a business in his spare room at home…and banked well over £50Million!! It’s a far cry from where I came from and what I’d grown up with. As a lad, I was born and raised in a one bedroom caravan by my parents. My Mum and Dad could best be described as ‘potless’ for most of their lives. They spent most of their adult lives scraping a living together in a little hardware store they ran at the bottom of the town. I went to school on the local council estate and never did very well. My Dad wanted me to go into the family business – so I was packed off to the local technical college when I left school, to learn about “business”. But I was a failure. I remember the look of absolute bewilderment on the face of the lecturer who used to teach us ‘accountancy’. Seems I was the only person ever to fail the accountancy exam. What made it a real kick in the teeth, as far as he was concerned, was that HE wrote the exam paper – HE told us what to revise…and yet I STILL failed!! He was beside himself. It wasn’t my fault. I simply didn’t understand what the rows of figures on a balance sheet meant. In fact – I still don’t even now!! I understand that if I buy something for £5 and sell it for £50 – or I buy something for £50 and sell it for almost £2,000 (which I do all the time in my business) – there’s a nice chunk of profit in there. (Through my workshops and training events, I share the money making system I use – and show how you can copy my way of making these huge profits for yourself if you wish. The book originally published by John Wiley & Sons, written by AWARD WINNING entrepreneur, Andrew Reynolds. COPY THIS IDEA provided a brilliantly simple read – with no technical babble or boring business jargon. In the book readers learned about the simple system he used to go from dull corporate job to becoming a multi-millionaire starting in his spare room at home.